As the Panthers season slipped away, with a 12-9 loss to the New Orleans Saints, their sixth straight, dropping them under .500 and out of the playoff picture, Cam Newton stood at the podium disheartened and raw, laying plain the shoulder issues that had slowly deteriorated his ability to throw the ball down the field over the course of the season, saying that he didn’t know what was wrong with the joint and no amount of massage or treatment had made the lingering soreness go away. Fast forward six weeks and Newton is telling a different story, after a successful arthroscopic procedure done by team physician Dr. Pat Connor, Newton is in his hometown of Atlanta for the Super Bowl and told radio station 680 The Fan that he was in good spirits after going under the knife last week. 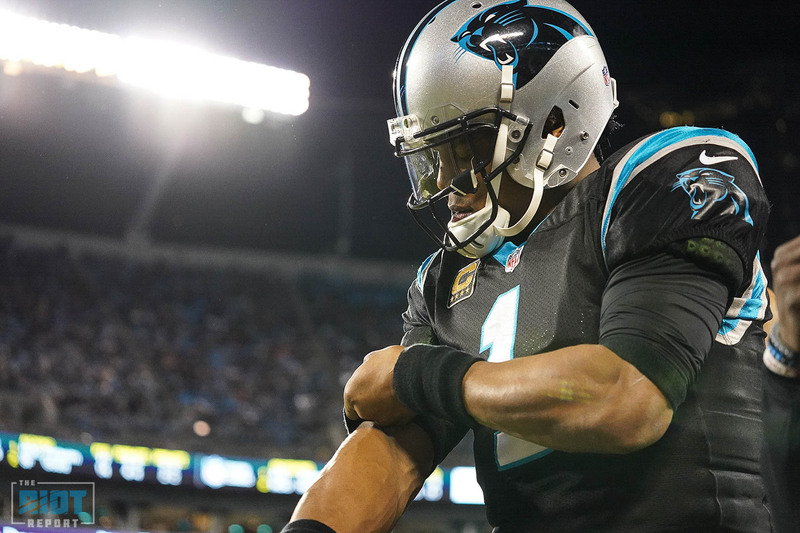 Part of the Panthers late-season swoon certainly had to do with the shoulder problems Cam Newton faced, and the numbers back that up. 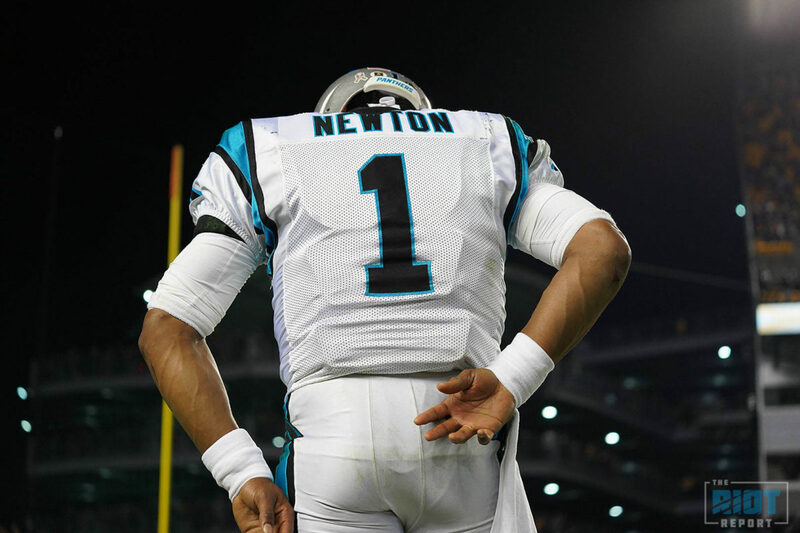 Via Airyards.com, Newton’s 7.5-yard average depth of target is by far the lowest of his career. Compare that to his MVP season in 2015, where that number was 10.4 yards. For a deeper perspective, here’s Newton’s season-by-season average depth of target. It certainly was – and perhaps even more than we thought during the season. 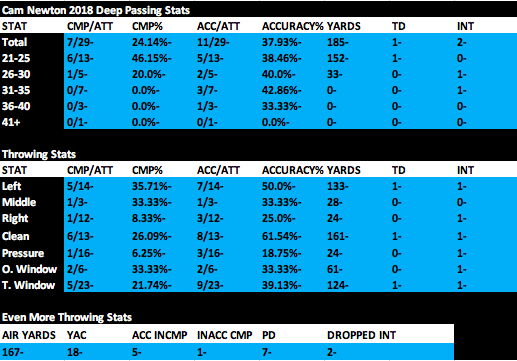 I do a lot of charting on downfield passing in the offseason for an annual piece called The Deep Ball Project, where I look at how accurate quarterbacks are at throwing the ball downfield in a deeper context than just the raw stats. In previous years, Newton actually threw the deep ball really well, but injuries from last season derailed the level of accuracy he could throw with. With that said, here’s a comparison of Newton’s deep passing accuracy in 2016, 2017 and 2018. Obviously this chart is primitive in comparison to the charts from 2017 and 2018. The 2016-17 Deep Ball Project was the last where I used letter grades, as I felt they were too subjective. Exclusive to this edition was TD%, INT%, and yards per game. Newton’s accuracy on throws of 16+ yards and 20+ yards both ranked eighth among all quarterbacks in 2016. His accuracy on 20+ throws actually goes up after offseason surgery from 53.3% in 2016 to 54.55% in 2017. So even with the shoulder injury affecting him in the last few games of the 2016 season, this was not enough to damper what was an excellent downfield passing season for Cam in 2016. As you can see here, Newton’s accuracy numbers (ACC%) for the 2017 season mostly rank in the top 10, His brilliance throwing into tight windows (sixth in accuracy with 50.0%) and under pressure (seventh in accuracy with 54.5%) are noted here – but the passes that traveled more than 35 yards in the air saw Newton complete only two of 14 bombs. Stats exclusive to the 2017-18 edition include 16-19 air yards, Play Action, Off Balance (throws where the QB doesn’t plant his feet), and stat percentages as seen at the bottom of the chart. These look at the percentage of pass attempts that came in a clean pocket, under pressure, with play action, in a tight/open window, etc. For example, Newton had the fourth lowest percentage of passes using play action (12.9%), ranking 31 out of 35 quarterbacks for this latest edition. As you may have noticed, the distances for the 2018-19 edition have changed. Throws of 16-20 yards are gone entirely, and 20-24 has changed to 21-25, 25-29 has changed to 26-30, 30-34 to 31-35, 35-39 to 36-40, and 40+ has been changed to 41+. New stats include Left/Middle/Right (areas of the field the ball was thrown to), Air Yards, Yards after the Catch, Passes Defensed, and Dropped Interceptions. So, I charted the throws – eliminating intentional throwaways, passes negated by penalty (passes where the penalty is declined or unnecessary roughness is applied to a completed pass are included), miscommunications, and batted passes – Any throw that reached at the very least 21 yards in the air qualifies. Clean Pocket throws emphasize, obviously, throws with clean pass protection, while Pressure refers to the opposite. Open Window throws demonstrate throws where the receiver has clear separation, while tight window throws emphasize windows where the QB needs to throw the receiver open with zero margin for error. 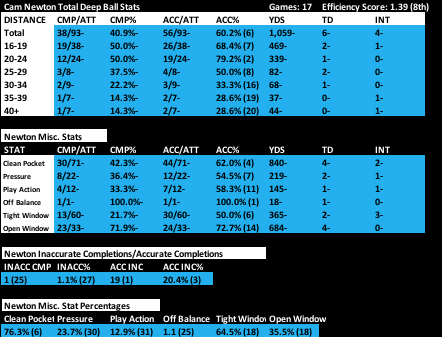 Accurate Incompletions (ACC INCMP) look at accurate throws that were dropped or couldn’t be hauled in, while Inaccurate Completions (INACC CMP) look at throws where the QB didn’t provide an accurate throw but the receiver bailed him out on a great adjustment. The numbers 21-25, 26-30, 31-35, 36-40 and 41+ imply the amount of air yards thrown by the QB on a pass. Air Yards goes without saying, as does Yards after Catch (YAC). Passes Defensed (PD) include breakups, dropped interceptions, and interceptions. Passes batted at the line of scrimmage are not counted. Newton’s accuracy under pressure, into open windows and into tight windows all took a huge step down. While his receivers lessened the amount of drops/failed receptions – those are noted as Accurate Incompletions (ACC INCMP) – Newton’s inaccuracy as the season progressed prevented this from mattering. After recovering from offseason surgery ahead of the 2017 season – his throws over 20+ yards only dropped from 54.55% to 53.3% from 2016 to 2017. However, Newton’s ability to go deep fell off a virtual cliff in 2018, only completing 7/29 throws over 21 yards (24.14 completion percentage) – there was only one pass over 25 yards in the air that was completed. Even early in the season, Newton’s accuracy down the field never got going. He was only accurate on 3 of 11 passes in his first five games, which is an accuracy percentage of 27.27%. A low point was in Week 13 against the Buccaneers, where he was only accurate on 1 of 6 passes of 21+ air yards (16.67%). Though they lost to the Browns, Newton was accurate on 3 of 4 vertical passes that day, and that marked the last game where he attempted a pass that far before he was shut down for the season. In 2017, Newton attempted 57 passes over 20 yards in the air. In 2018, that number fell to 29. Johnny Kinsley has been an NFL writer for five years.  In addition to The Riot Report, he also writes for the SB Nation blogs Music City Miracles and The Phinsider, USA Today's The Jets' Wire, Purple PTSD, 49ers Hub, is a video analyst at Dynasty Trade Calculator, and is the co-host of the podcast The Yacht Party. Kinsley claims that The Legend of Zelda: The Wind Waker is the best game in the series, and agrees with the rest of the world that groupthink is bad.